Riding 600k’s or so for lunch, saying g’day to whoever turns up then riding home. The minimum target distance for the day, 1000km. That’s a FarRide. Today’s destination was Texas in Queensland. I’ve never been to Texas so I was really keen to go and also to try out the KTM 1290 Super Adventure on a decent day’s ride. Bill, (Kawasaki Versys 650), planned a route that took in a bunch of roads I hadn’t ridden before that saw us leave Hexham bang on 5am. 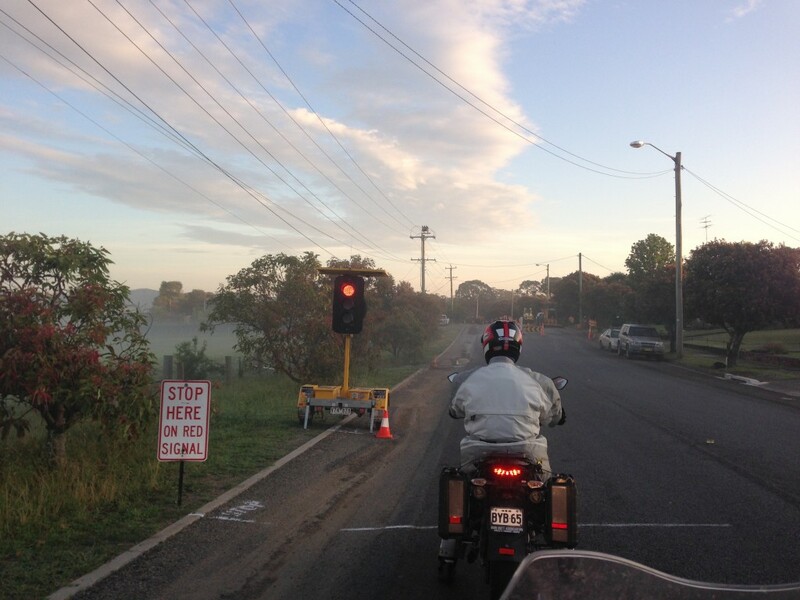 We rode north up the Pacific Hwy and just after the Hexham Bridge saw a couple of riders by the side of the road. All OK, but looking a the bikes and setup there was no doubt we’d see them in Texas. We turned on to the Bucketts Way, rode through Stroud and as will always, found the roadworks traffic control just before Gloucester red with not another vehicle in sight. While there a bright yellow Honda F6B pulled in behind us and I rolled back for a quick chat. Then we stopped at Gloucester for Bill to change to daytime sunnies, clean his visor etc. I just wear clear glasses most of the time now. For a day ride the flip down tinted visor in the Shoei Neotec does just fine. The F6B kept going and gave a wave as he passed and I suspected he’d also be in Texas for lunch. Then it was out past Barrington and a right turn on to Thunderbolts Way. I warned Bill that if we got separated on the bends we could meet back up at Carson’s Lookout (or the Love Dunny Lookout). I arrived first, took a couple of snaps, had a drink a muesli bar and enjoyed the view. It’s a great spot to be in the early morning. and waited to grab a snap of Bill as he rode past. You should be looking through the corner Bill, not at me! Immediately after this intersection was a mad narrow, tight, twisty, bumpy downhill I hadn’t expected but made the most of! This road took us through Dungowan and punched out onto the New England Hwy. 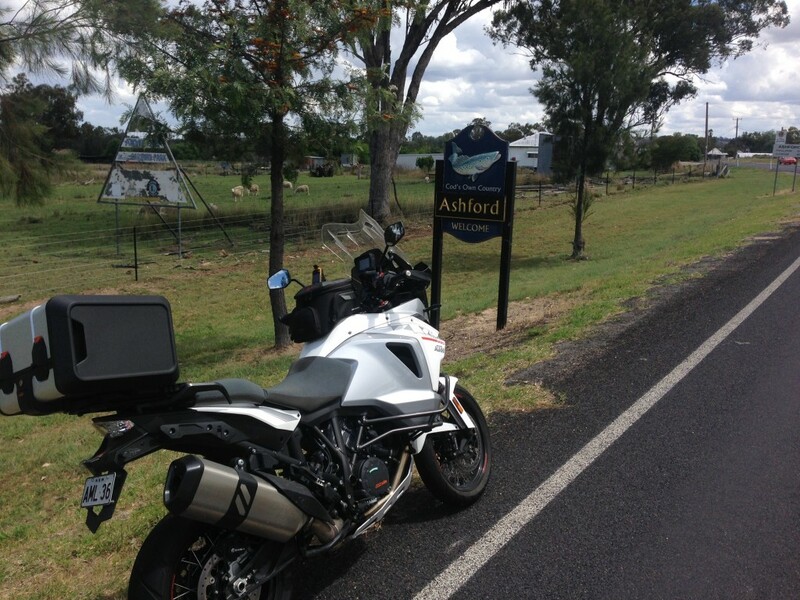 It felt the wrong way given our destination but we turned left and rode through Tamworth and refuelled. 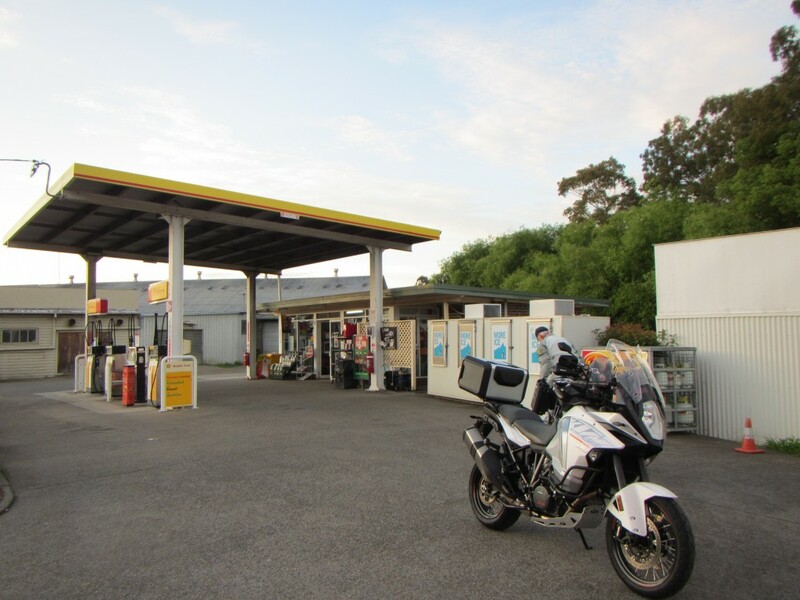 This route north took us through Barraba, Bingara and Warialda where we stopped for a quick break and topped up the tanks. 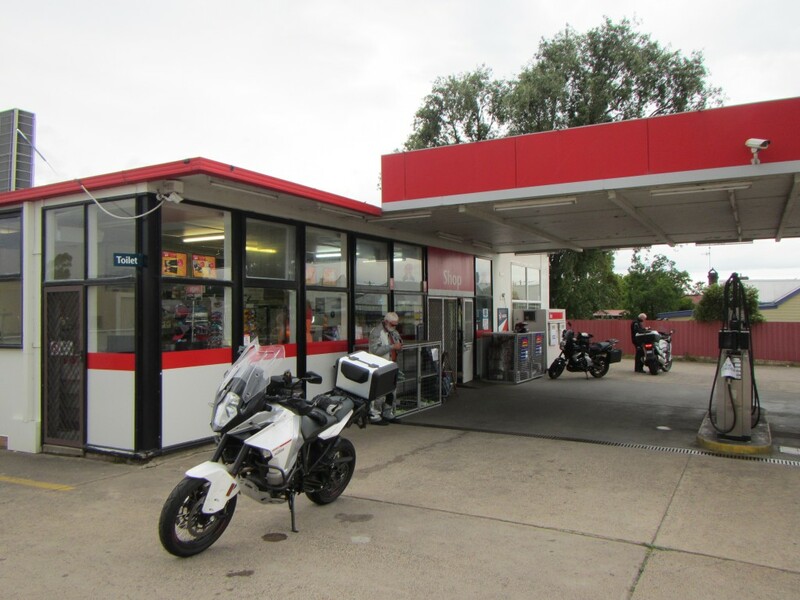 This was the last stop before Texas, we were 15 minutes behind schedule but were still OK to arrive for the FarRide checkin window that would close at 12pm sharp (Queensland time which is AEDST – 10 years 1 hr). It can be embarrassing if you miss the checkin time and even if you are a minute late you are a DNF. We continued to Yetman, and saw MildThing and a friend by the side of the road. FarRides are funny, the closer you get to checking the more bikes you come across converging on the location. You always look for the thumbs up so you know that everything’s OK. It’d be incredibly bad form to ride past someone who was having any difficulties, waving as you go. 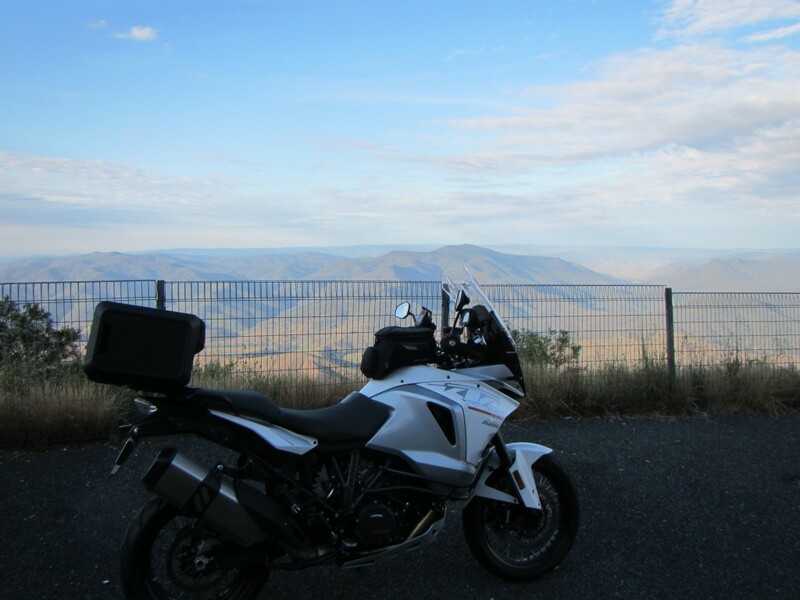 I hadn’t done a Border crossing at Texas before so I had to stop for a pic, we had made up most of the time we’d dropped before Warialda so there was no need to be concerned about a couple of minutes. 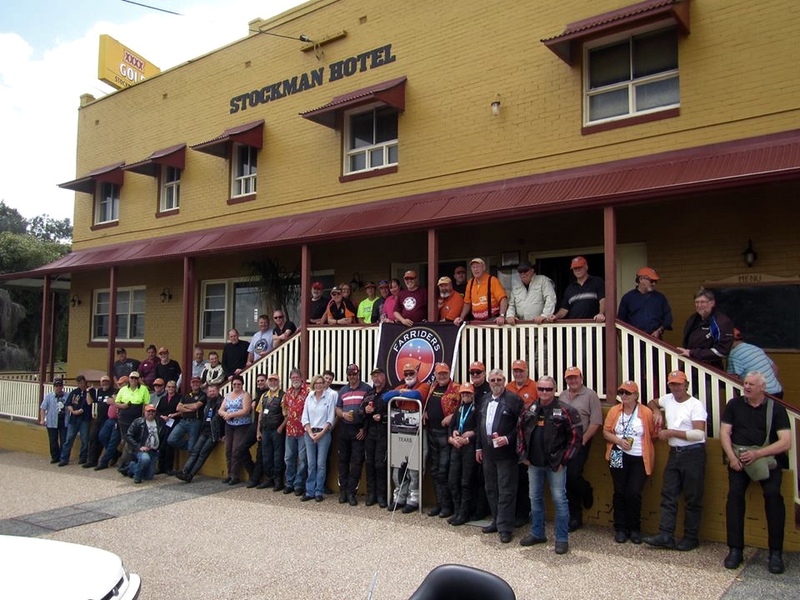 Arriving at the Stockman Hotel, Texas both sides of the street were lined with bikes of all descriptions. There’s no “bike brand” discrimination with FarRiders. Everyone’s got their preferences but if it’s got a motor , two or three wheels and it makes it to the ride location it’s a great bike to be on. 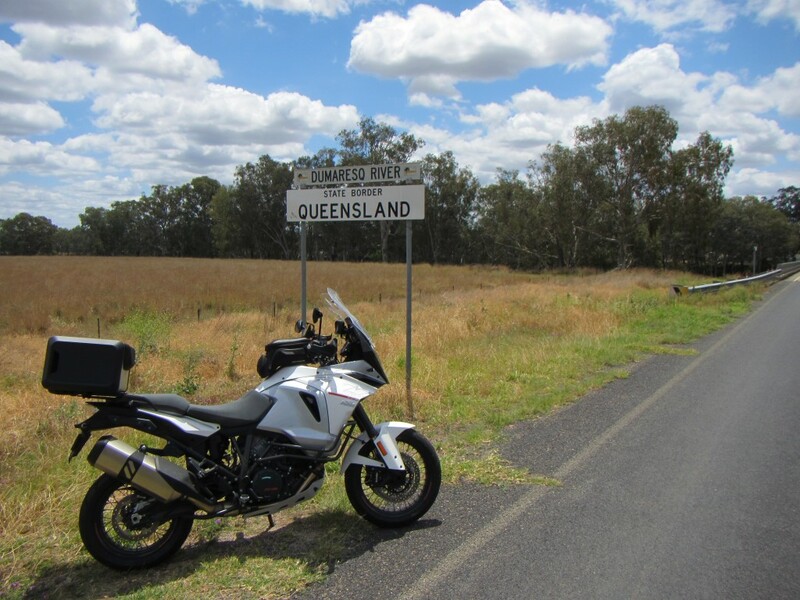 My cousin, Clay, on his CVO Fat Bob, had ridden with a few mates from Brisbane – with some detours – on their first FarRide. There were many first timers today (coined FarVirgins). Checkin had opened so I presented my timestamped start docket (from Hexham) and lined up again for a sausage sanga. The local kindergarten was doing a BBQ as a fundraiser and the publican, Helen, was keen to help so they were able set up at the Hotel. The FarTin was taken around and additional donations were made by many of the riders. It’s fantastic to have the opportunity to help local communities out like that and great that they can be involved. Excellent PR for bikers in general. and leave to finish their 1000+ k’s for the day. It takes a while to put names to the faces of people you only see two or three times a year for three minutes but no-one really cares about names, it’s the stories of the rides, bikes and a love of riding we share. It’s like speed dating without the hassles of wanting to take anyone home. An hour and a half after we arrived most riders had left, the kindergarten had a bag full of cash to provide stuff for the kids, the publican had made some $$$, no down side really. 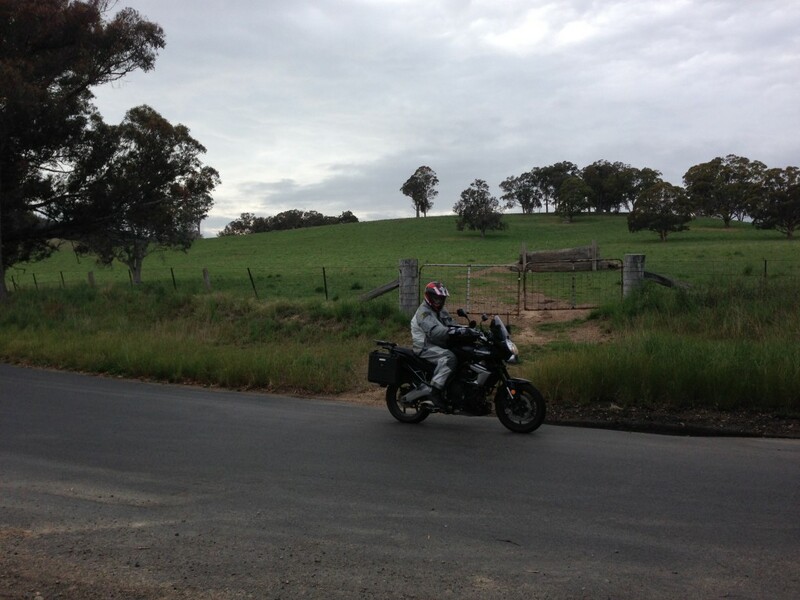 Another rider, Ian (BMW K1600GT), who was doing a FR12 Gold (1200k’s for the day with proper documentation) decided to ride back with Bill and I.
and more new roads for me. It’s very scenic up on the tablelands, shame the bike keeps getting in the way. 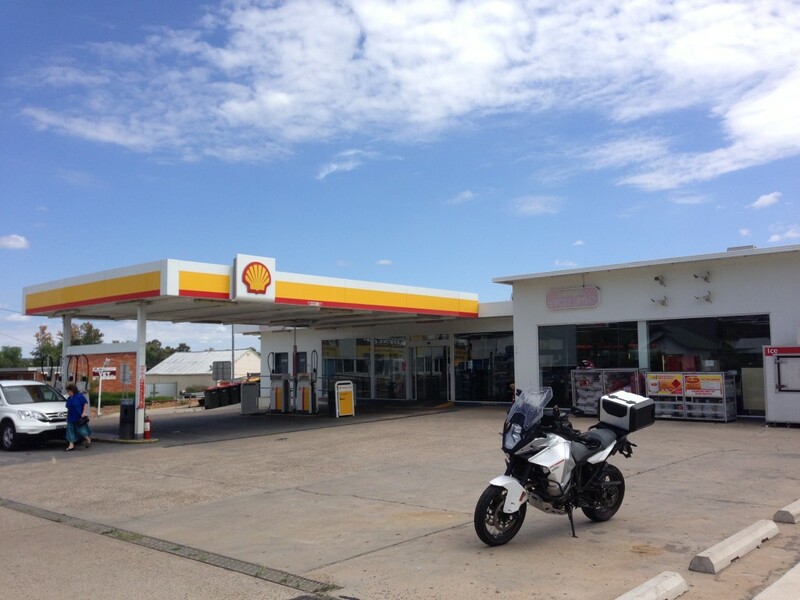 We rode to Inverell where we intended to get fuel. I checked with Bill that he had enough on board to get to Uralla which would mean only one more fuel stop home. He gave the thumbs up so we kept going. 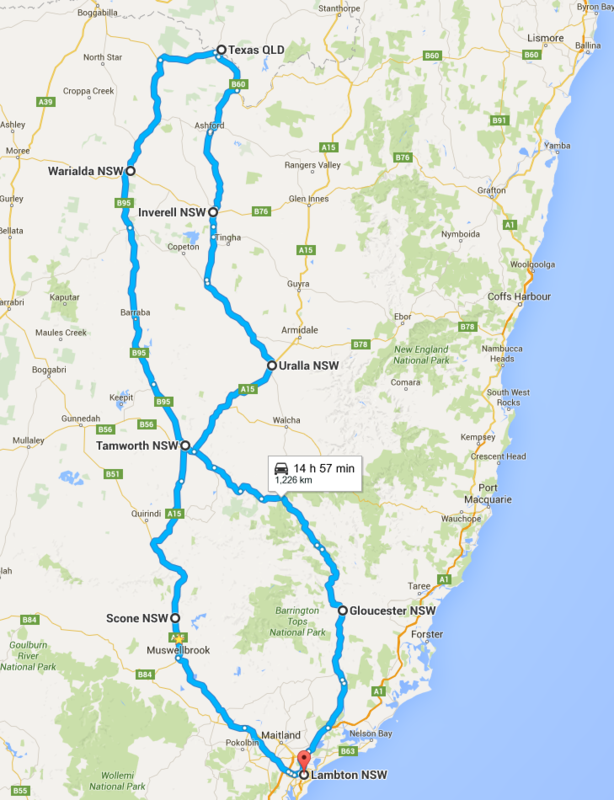 I got a little turned around trying to get out of town, I’d only every approached Inverell from the west. I looked to Bill for some route advice but got a “I haven’t got the route in my GPS, look for Bundarra”. That made two of us without the route in the GPS. I’m glad we’d made it this far. 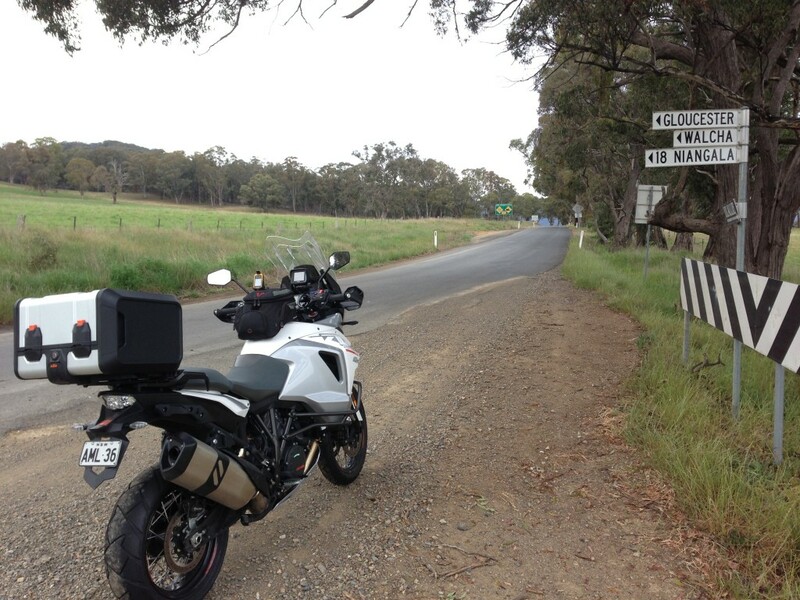 After a couple of uncertain corners I punched Uralla into the GPS and managed to find the start of Thunderbolts Way – Amateurs we are! 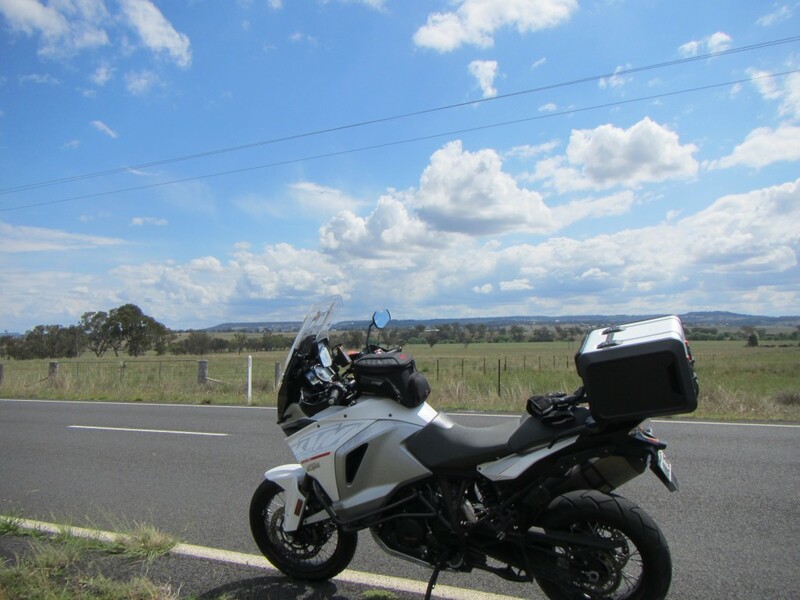 From there it’s a great run down Thunderbolts to Uralla where we stopped for the last fuel for the ride and had a bit of a break. That’s quite enough servo photos for one day! Some threatening clouds were about so we got ready for bad weather just in case. Good job we did because 5k’s south of Uralla it rained. 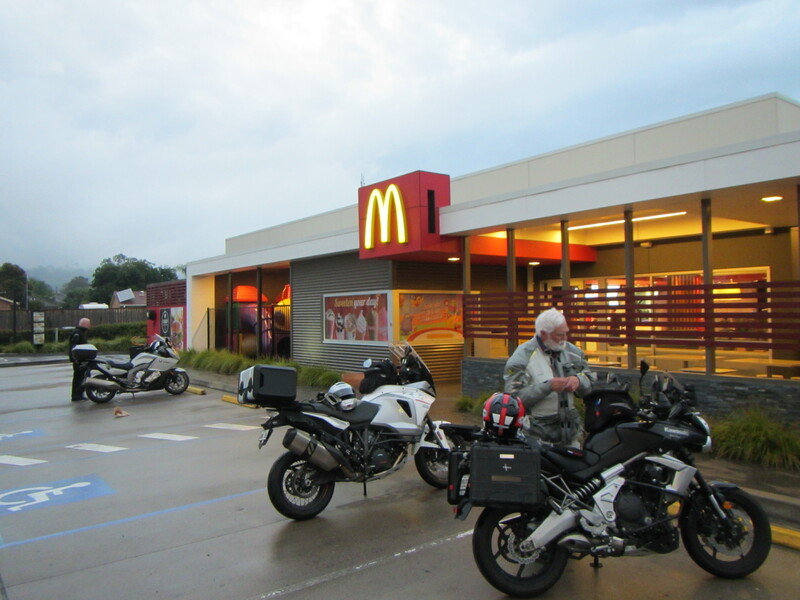 We rode through showers to Tamworth and some light rain and wet roads to Scone where we had agreed we’d stop for a bite to eat and a quick coffee. Darkness descended during the break so it was a quick goodbye and handshakes all ’round out into the night for the last 150kms home down the damp New England and riding through a few clouds across the range at Murrurundi. We went our separate ways on the Hunter Expressway with nods and waves and I was home before 10pm with 1270kms on the Odo for the day and 1234 by the GPS. A decent and very fun bimble. Here’s the route.